The Johnstown Tomahawks headed to the 2015 NAHL Showcase with a record of 1-1 after splitting the first regular season weekend in Wilkes-Barre and New Jersey. It was the first time in team history that they picked up a win in their opening weekend. The team looked great against the Knights, controlling most of the game once they went down 2-0. In New Jersey they didn't look bad, but things just didn't go their way. This year's team looked really well put together and you had to give credit to the coaching staff and GM, Rick Boyd, for the work they did in the offseason. Then, as the team road a bus for the 18 hour (or so) trip to the showcase, they added three more talented offensive pieces to the team. All three players were guys that didn't make their USHL teams, and had spent most of last year with the Tomahawks. Those players were, Luke Lynch, Casey Linkenheld, and Filip Buncis. And as the players exited the bus and made their way into the Swan Super Rink building, the team was even more talented then they were when they first got on the bus. The Tomahawks would finish the Showcase one game away from sweeping the event, something they had never done before. Even though they did lose their last game, they still finished with a record of 3-1, and held their heads high as they returned to Johnstown with an overall record of 4-2 on the young season. Johnstown still has a couple weeks of road games before they open up their home schedule in Hockeyville. 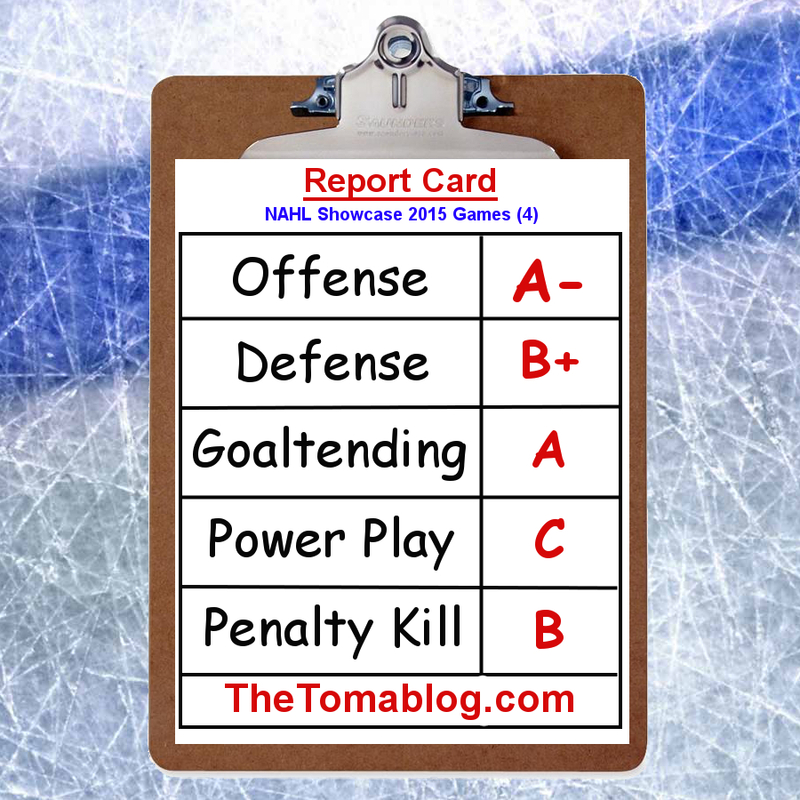 But before we look to that first home game, we have to review how they did at the showcase. Now this is a little tricky. We weren't there in person. We tried to watch all four games but Fasthockey was having major problems, as all four games were filled with chunks of action missing and terrible buffering problems. With that said, we can't really tell you how they looked, because even though we were watching the games, we had a really hard time seeing what was going on. 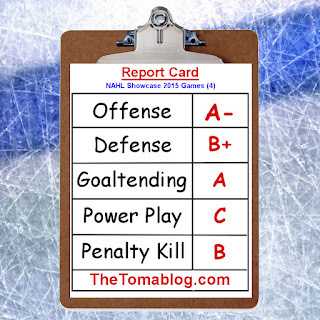 We have to do our ratings based on the score-sheets, so that's just what we did. Remember, as with every report card review we do, this is our opinion and our opinion only. We'd like to hear (see) what grades you'd give the team. Tell us on our Facebook page. Or on Twitter. You can also simply leave a comment on this article. We like hearing from Hawk Nation. Offense - When you play four games in a row and can win three of them, you automatically get a high offensive rating. The only game that Johnstown really blew a team away was against Brookings. In that game, the second game of the Showcase, Johnstown scored four unanswered goals to win 4-0. More on that in the goaltending section. Johnstown kicked off the showcase with a tight 2-1 victory over South division's Corpus Christi IceRays. The third game they played another tight game, finding the edge over Coulee Region, 3-2. In the last game of the showcase, Johnstown fell to Lone Star 5-2 and picked up their second loss of the season. Kelly O'Brien had a very strong four games for the Tomahawks. He played so well in fact that the NAHL named him an honorable mention for the East Division stars of the week. Along with O'Brien, Alex Alger was also an honorable mention. The three players sent back to Johnstown from the USHL made an immediate impact with the Tomahawks. Lynch had a goal and an assist in the game vs the IceRays. He had another goal vs Coulee Region. Linkenheld had two assists vs Brookings. He followed that up with a goal against Coulee Region the next day. Buncis had a goal and an assist in the loss to Lone Star. Johnstown didn't score a ton of goals but they got the goals they needed. Hopefully that continues throughout the year. Players like O'Brien, Horn, Heakins, Jaquay, and Delandro, are on pace or already have beat their scoring totals from last season. This is great news as seeing we've only played two weeks of the 2015-2016 NAHL season. Having production from these players, mixed in with guys like Alger, Romano, Lynch, and Linkenheld, will make Johnstown a hard team to defend against. Defense - Once again, not focusing too much attention on the Lone Star game, Johnstown's defense showed up in the showcase and shut the door, limiting scoring chances against. Only six players were minus against the Chill, and even though they lost 5-3 vs Lone Star, only six players ended with minuses on boxscore as well. The highlight game for the defense and goaltending was the game vs Brookings, where the team earned the first shutout of the season, 4-0. Sure, there are a few things that the team needs to tighten up on the defensive side of the puck, but I'll take 3-1 record any week. Goaltending - Gwillim played two games in the showcase, while DeSimone and Burggabe each played one. Gwillim went 1-1, while the other two goaltenders each won their games they appeared in. DeSimone, playing in his first game of the season, took his spot in between the pipes and was perfect. Last season when Bednard was out for a little over a month, DeSimone was a nice call up to have, before his season ended due to injury. DeSimone picked up right were he left off last season with stellar play, getting his first shutout at the NAHL level. With all three goalies getting a win, you can't argue that the Tomahawks' best players in the Showcase were the men in net. A great job by all of them. Power Play - The power play only scored two goals in seventeen chances. In total the team has four power plays on the season. The way this team has shown to be able to play at even strength, if they can produce more on the power play, the Tomahawks could become the deadliest team to face in the league. As with last weekend's report card article, it's still too early to worry about the power play, but it is something that hopefully will get better as the weeks move along. Penalty Kill - The Tomahawks were shorthanded twenty-three times in four games, but only allowed two goals. They also saw themselves on the wrong end of a few 5-3 man advantages. On the season, Johnstown ranks 7th in the league in penalty killing. There's really no issues with the penalty kill as they are doing, and did at the showcase, a fine job of killing penalties. The issue, as seems to be a trend for Johnstown throughout the years, is taking too many penalties. There's playing tough, and then there's taking dumb penalties. Johnstown in six games so far this season has a total of 175 penalty minutes, which gives them the lead in the entire league. Taking so many penalties hasn't hurt them yet, but you can only imagine its a matter of time. The best way to kill penalties is to not take them at all, or at least limit their frequency. We'll have to see if the team can become more discipline one as the season goes on. Final Thoughts - The Tomahawks played well and have all the fans in Johnstown excited to see them play in person. The games we've watched, it seems like this years team is very focused and willing to do the things you have to do to win games. This probably has to do with all of the veteran players the Tomahawks have on their roster this season. This is the best start to a year Johnstown has had in their brief history, and all Johnstown fans hope it continues. Even though in past seasons the Tomahawks have had slow starts, it's not when the team has played there worst hockey. That has happened once the new year kicks in. After the change of the calendar, the Tomahawks past teams have hit walls and nosedived. In 2013-2014 they would only win two of their last 15 games, and last season they only won nine of their last twenty-eight games. Hopefully this kind of play doesn't happen again this season, but it's good to see the team picking up points early in the year, which will help if they falter at the end. Note: The NHL released their Preliminary Player to Watch for the upcoming 2016 NHL draft. On the list there are eleven players listed from the NAHL. One of those players is Johnstown Tomahawks' defenseman Zakery Galamobs. Galamobs has played in four games for Johnstown so far, scoring one goal and has a +4 on ice rating. Last season Galamobs spent some time with the Janesville Jets where he had one goal and was a minus one in thirteen games. 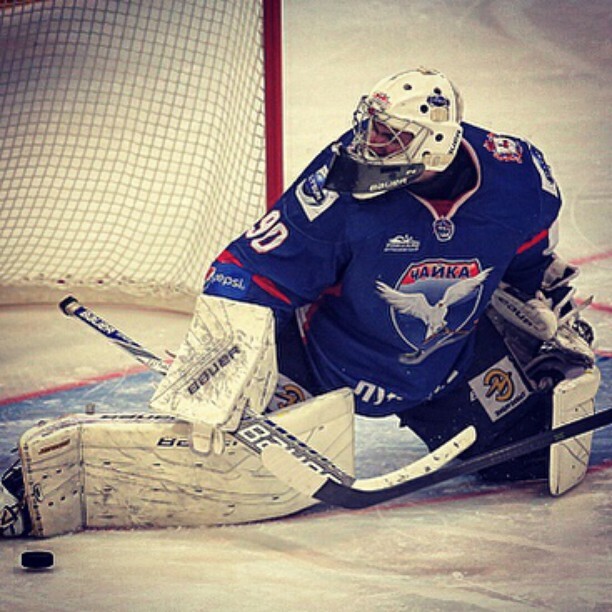 Ryan Bednard, who played for the Tomahawks last season in net, was also a player to be featured in the Players to Watch list for the 2015 NHL draft and later was selected by the Florida Panthers in this offseason's NHL entry draft. 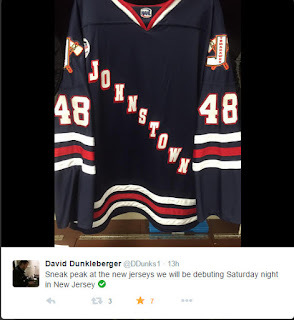 On Saturday, in New Jersey, the Johnstown Tomahawks wore a new style jersey for the 2015-2016. If you haven't seen it, just look below. This new "classic" jersey brings us memories of when the Johnstown Chiefs were still in town and wore a jersey just like this in the early 90's. Also, if you're a hockey fan then you'll know the New York Rangers wear a similar style jersey to this one. 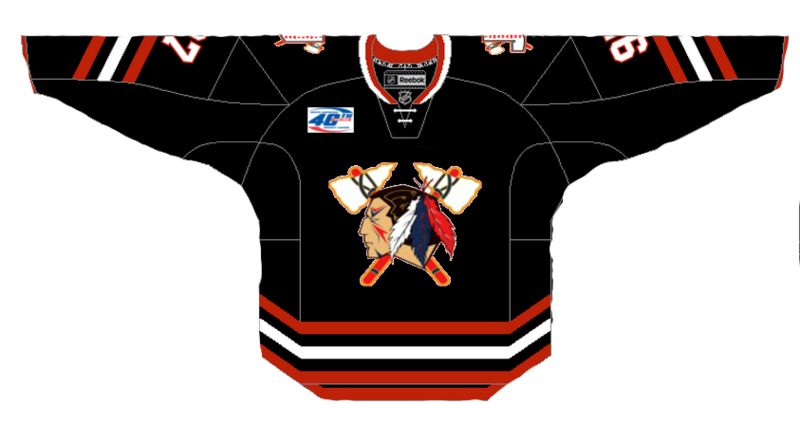 First impressions is that it's a pretty nice jersey, and in the Tomahawks' fourth season, a nice addition to the overall history of Tomahawks' jerseys. With that said, I don't think it's a "must go to the team store immediately to buy myself one", good. I'm not the biggest fan of the Tomahawks' uniforms overall. To me there a little bland. Sure, the logo is pretty great, as well as the secondary logo's on the shoulders of the jersey's, but other than the few solid lines at the bottom, there's really nothing to them. This one just looks flashier. But, that's our taste. 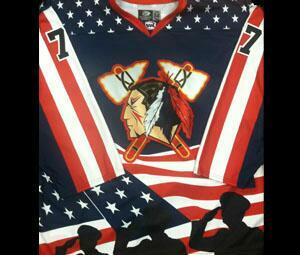 Every year the Tomahawks have several "special" jerseys. Military night, and Gun and Hoses are always great designs. We even liked the Valentines Day jersey, though many people hated those. Here's the military jersey that the team wore two seasons ago. A jersey that is a fan favorite, and player favorite is the team's "third" jersey. This, of course, is the red jersey. Sure, it has the same style as the others, except this one is dominantly red, but it looks great. This uniform is taken from the Chicago Blackhawks who have a red uniform and who's logo looks like it's a relative of the Tomahawks' logo. With that said, I got to thinking. Why don't we take another design tip from the Blackhawks for a new jersey? I think this one would look great, and would also fly off the shelves in the Tomahawks' team shore. Any team, any sport, any place in the world, looks great in a black uniform. I opened up Photoshop and did some editing to give all you readers a look at what the jersey's would look like. I went with the Outdoor Classic game jersey, just because the design is a bit different from what we're use to seeing. What do you think? Like it? Hate it? I'm sure at some point, maybe a few years from now, we'll see Johnstown with this jersey or a variation of it. When ever that time comes, it'll be great to see and make for a great tandem with the red and white jerseys. The first weekend of the new season is in the books and the Tomahawks made a bit of history. That history? The 2015-2016 Johnstown team is the first Tomahawks team to win the first game of the season in franchise history. Back in their first season, vs. Port Huron, they did pick up a point in overtime but didn't record their first two points until the NAHL showcase. In the first game of the season against the Wilkes/Barrie-Scranton Knights the Tomahawks fought back from down 2-0 to put on an offensive showing, winning 7-3. The following night things didn't go as well, as the Tomahawks fell to the New Jersey Titans, 5-2. If you want game recaps, then head over to Johnstowntomahawks.com and check those out. This year we're going to try and do something a little different with weekend reviews. We're going to give our personal thoughts and feedback of the games, and give the team a grade on how well we think they played. Offense - When you look at this years roster, it might be the most skilled team we've had yet. With that said, there are still many question marks and things that we'll have to see play out. One of those question marks we have is if the Tomahawks will be able to put up good offensive numbers. There are guys on the roster that have decent numbers in the past, and hopefully with another season under their belt, they can perform even better than before. Then there are guys that have shown the skills to be able to put up some decent numbers, but haven't done so yet. One of those guys is returning forward, Joe Delandro. Last season, Delandro appeared in 11 games for Johnstown, scoring one goal and one assist. In two games so far this season he has one goal and one assist. Delandro probably isn't going to put up a ton of points, but if he can contribute now and then, it'll be an added bonus for a guy who has great size and plays a good checking game. Another question mark, in our eyes, who played last season for the Michigan Warriors is, Anthony Parruccia. Parruccia had a good training camp and found himself playing top minutes in the Tomahawks' first two games of the season. He's a '95 birth year player, meaning this is his last season of juniors for him. Last year for the Warriors, he played in 39 games, scoring only five points. In the first two games this past weekend, Parruccia found himself on the score sheet a total of four times. One more point and Parruccia will tie his numbers from last season. Everything he does beyond that will be a great addition to our roster. If Parruccia continues his solid play in Johnstown's line up, he'll be one of our best free agent pick ups of the offseason. In Wilkes-Barrie, things didn't start off pretty, but once Johnstown got to it's game, they were dominate. They controlled the play and held the Knights in their zone for most of the game. When the opportunities arose, they didn't hesitate to take advantage. The same couldn't be said the next night in New Jersey. Though the game was close for most of it, Johnstown never seemed to get to the game that they had played the night before. We can't be to critical about things just yet, as this was only the first two games of a 64 game season. All in all though, the Tomahawks should be good offensively this season. Other guys that made a good impression on the offensive side of things this weekend were: Andrew Romano, Dalton Hunter, Brendan Jaquay, Cameron Smith, and Dante Suffredini. Defense - After going 1-1 in the first two games of the season, and only allowing three goals in the first game, you can't really be too upset with the defense, no matter how many goals were given up the following night (five, by the way). When you look deeper into the goals given up you'll see that two of them on Saturday night came on the penalty kill. Logan Hudson, might be the new team captain but he was still playing his same old game, and doing it very well. Hudson found himself in the middle of a couple scraps over the weekend, defending teammates who had been victoms of bad hits. Hudson, with the gloves on, also played solid defense, with an overall +3 raiting on the weekend. A newcomer on the blue-line that really impressed us was another former Michigan Warriors' player, Ryan Burr. Burr is wearing number 24 this season, and a few times reminded us of Tomahawks' alumni Alex Jaeckle, who of course wore the same number. It seemed like Burr never left the ice this weekend, as he saw himself playing top minutes. The only time he wasn't on the ice was in the second game vs New Jersey, when he was sitting in the penalty box after racking up 17 minutes in penalties stemming from a fight he had in the first period. Burr had one assist over the weekend, but what's more impressive was his skating ability. We don't really remember him that much from Michigan, but that can be seen as a complement. When you don't notice a defensmen that can be because he's doing his job and not making mistakes. He did a good job this weekend as well, and the only reason we noticed him so much over the weekend was because he seemed to be in the middle of every play. That's not a bad thing. Standing at 6'3 and 196 pounds also makes him a very visible player out on the ice just based on his size. As a team, Johnstown is a +1, scoring 9 goals and allow 8 on the young season. You can't be too mad about that, even if one of the games they gave up five goals. Goaltending - Currently the Tomahawks are carrying three goalies on their roster. Over the weekend, two of the three goalies saw action. In game one, Jake Gwillim took the net for the Tomahawks. At the start he seemed a little shaky and gave up two first period goals. After that, Gwillim shut the door and didn't allow another until very late in the third period, when the game was already in the win column for Johnstown. Gwillim faced 31 shots and turned away 28 giving him his first win of the season, and a save percentage of .903. Remembering back to our days in school, a 90% was good for an A. The next night, rookie Camden Burggrabe was in net to take on the New Jersey Titans. For him, the night didn't go so well, as he gave up all five goals to the Titans. It was tough to say how he played since the cameraman on Fasthockey didn't really know how to operate a camera and keep it focused on the action. With that said, five goals on 31 shots, just isn't quite good enough, evident of his save percentage of .839. For those not to familiar with hockey, a save percentage of .900 or above is where you want to be at. Now, as with everything about these first two games, we're not going to get super excited with the win, and we're not going to get extremely upset over the loss. I mean, we've only played two games so far. Burggrabe already has a college commitment to D1's Northern Michigan University, so we're chalking up this loss as just that, a first loss. Now Burggrabe has a game under his belt at the tier two junior hockey level and he can relax a bit for his next start. Power Play - We're not going into great detail with this or the Penalty Kill simply because it's too early to make a judgement on special teams. Overall Johnstown went 2 for 12 on the power play, with a goal in each game. That's 16% good for 10th in the league. Penalty Kill - The Tomahawks were on the penalty kill 11 times over the weekend, 8 of which vs New Jersey. They allowed two goals, vs New Jersey. If Johnstown kills those two off they only loose, 3-2. Then again, if the game was only 3-2, Johnstown might be able to come back and find a way to win. The penalty kill has to be get better and judging on how they've done in the past on the PK we believe that'll happen. Overall - It's great to enter the NAHL showcase already with a win and tied for first place in the East Division. Now, it's all about improving on their game from this past weekend. There was a lot to like from these first two games, and some questions as well, but after two games, we're okay with the results. The Showcase starts Wednesday, where the Tomahawks will play four games in four days against out of division teams. Note: Players that didn't play in either game this weekend were: Zak Galambos, Tommy Horn, Kelly O'Brien, and Nick DeSimone. This season the Johnstown Tomahawks will be playing in a new division and facing brand new teams, well at least new cities. Gone from the league and/or their division are the Michigan Warriors, Soo Eagles, Keystone Ice Miners, Janesville Jets, and the Springfield Jr Blues. The Janesville Jets and Springfield Jr. Blues are still in the NAHL, but will now play in the Midwest division. The Michigan Warriors were going to move to Brooklyn New York, but those plans, at least for the 2015-2016 season fell through. The Warriors left Flint because the city got a higher level junior hockey team, the Flint Firebirds of the OHL. The closest team to Johnstown last season, the Keystone Ice Miners, folded. Smartly, the Tomahawks picked up a handful of their players for the upcoming season. The Soo Eagles moved to New Jersey to become the Jr. Titans, a team that will be in Johnstown's division this year. The two new teams joining the East division are, the Wilkes Barre/Scanton Knights, who are an expansion team, and the Aston Rebels who relocated to Pa from Texas. Last season Aston was known by the name of the Rio Grande Valley Killer Bees. Along with the move up north and into the NAHL East division, they brought a handful of their Killer Bees' roster. 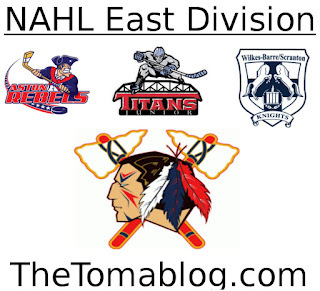 So, this season the Tomahawks are in the league's smallest division, with only four teams. This means that for most of the season, Johnstown will be playing the same three teams over and over again. Before we get into that and what this article is all about, Johnstown will play four out of division teams at the NAHL Showcase. They will also travel to Alaska again this season to play both Alaskan teams. Later, those two teams will make the journey to Johnstown. Now, playing the same three teams in the division will undoubtedly build huge rivalries. It'll be like playoff hockey, every night. For a fan that'll be fun to see. Though the downside for fans is that you'll be seeing so much of the same team, night in and night out things might get a little stale. The bad thing with playing the same three teams over and over again is that if the Tomahawks struggle against a certain team (and god forbid two) it'll be a very long and painful season. In years past the Tomahawks had their troubles vs. the Port Huron Fighting Falcons. When Port Huron moved to Keystone last season, Keystone really had the upper hand on Johnstown. Johnstown finished the season 3-6-3 vs Keystone. 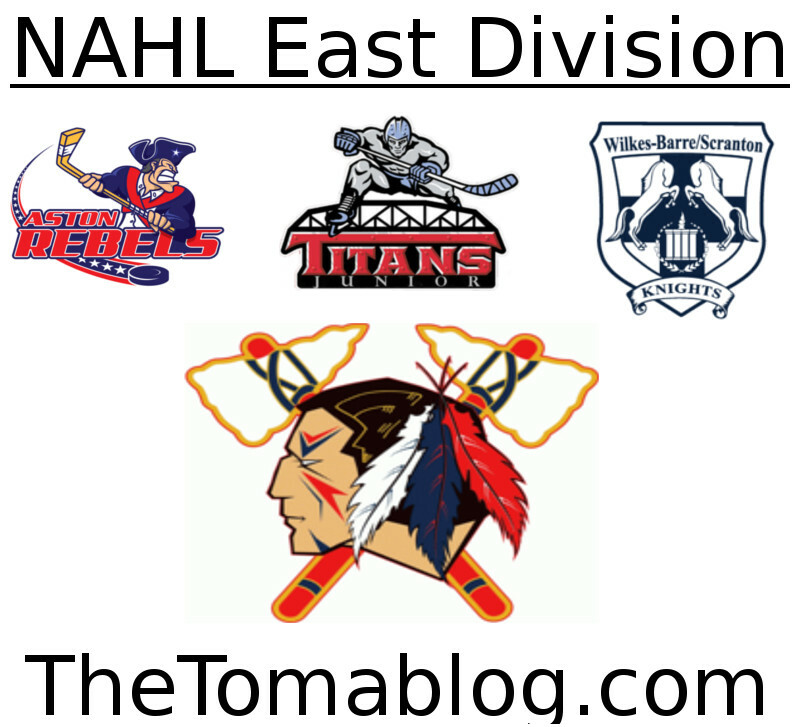 Last year, the North division had six teams, counting the Tomahawks. Though you don't want to struggle against anyone, having one team you can't beat out of five is better than one team you can't beat out of three. This weekend the Tomahawks play two exhibition games against Aston. Not only will it be a good time to face a team in their division and see how they stack up again them, but it'll also give them a shot to inflict some early damage on the in-division foe. In the regular season the Tomahawks will play Aston, New Jersey, and Wilkes-Barre each 16 times. This has to be the season Johnstown has the upper hand on at least two teams in the division or it's going to be a painful year. Hockey season is here once again. The Johnstown Tomahawks will play the first of three exhibition games tonight when they faceoff again the USHL's Youngstown Phantoms. This will be the fourth season (already) for the Tomahawks in Johnstown. The past three years have brought many talented players to the Cambria County War Memorial Arena, which is now the home of the first ever Hockeyville USA. Just like it is every season in junior hockey, the roster has seen a major turn over. Most players from last season's team have moved onto the college ranks or up to the USHL, like Ryan Bednard and Luke Lynch, who are with the Phantoms. With the exhibition season underway and the regular season approaching quickly I wanted to share some thoughts on the players I'm looking most forward to seeing on the ice this season, for one reason or another. I've selected six, but there is a ton more talent on this 2015-2016 roster that I could have easily picked. Out of the six players I chose, three are returning players from last year's Tomahawks' team, and three players are new to the team. Let's get started. This list is in no particular order. Steven is entering his second season with Johnstown. Last year, in his rookie season, he appeared in 48 games for the Tomahawks, scoring 23 points (3 goals, 20 assists) and had 10 penalty minutes. He ranked ninth on the team in scoring and was first among the defenseman core. Steven is a good skating defenseman who plays a pretty solid two-way game. Last season he had a plus minus rating of -5. The closest player that you could compare him to, of a past Johnstown player in my eyes would be, Casey Nelson. Nelson played for the Tomahawks during their first season in the NAHL. In 56 games, Nelson scored 32 points (10 goals, 22 assists) and was a -6. Johnstown hasn't had that sort of production from defense since Nelson was on the team. Could Quagliata reach towards those type of numbers this season? I don't see why not. Last season, when Quagliata registered at least one point the Tomahawks had a record of, 9-6-1. With a season already under his belt, and now becoming one of the veterans on the team, I think his production will only improve, and that's a good thing for Johnstown. Hudson was named team captain early into this past off season, and it's much deserved. Hudson not only is a leader on the ice, but he's a leader off. There's nothing flashy about Hudson's game. He's not a guy that's going to put up offensive numbers. In 73 games for Johnstown, he has 5 points (2 goals, 3 assists). Hudson though, isn't on the team to score goals. No, he's on the team to help prevent them. He's also on the team to keep the opposing players honest. In 73 games with Johnstown, Hudson has racked up a total of 195 penalty minutes. Now don't make a rush to judgment. Hudson is not a goon, and in fact is one of the guys in the league that plays a pretty honest game. You won't see Hudson throwing cheap shots, or going out of his way to run a guy. That's probably the thing that impresses me the most about Hudson's game. He never is out of position. While there have been some guys on past teams that always seemed to be beat on defense, I can't recall a time when a rushing forward has beat Hudson to the net. What makes that even more impressive is that Hudson isn't the fastest guy on the team, but he knows how be in the right place at the right time. As stated before, if someone on the other team steps out of line, Hudson has no problem making them pay. This makes him not only a fan favorite but also a favorite amoug his teammates as they know, no matter what happens, he always has their backs. Hudson is a '95 birth year player and this will be his last season of junior hockey. A pure offensive threat that the team might have never had before. Alger was traded to Johnstown last season at the NAHL trading deadline. He came from last place Odessa where in 43 games he scored 10 goals, 12 assists, good for 22 points. When he got to Johnstown he put up the exact same numbers, except he did it in only 19 games. On a team that was filled with mostly minus players, Alger was one of only four players that had a plus rating. +1. What makes Alger a treat to watch is that when the puck is on his stick something always seems to happen. He's a legit scoring threat every time he steps out onto the ice. His brother, Austin, plays a similar style of hockey and reports for camps in the off season were that they showed great on-ice chemistry. Sadly for the Tomahawks, Austin is currently in camp with the USHL's Omaha Lancers. If he doesn't stick with Omaha he should be sent down to the Tomahawks. But even if the Alger brothers aren't united in Johnstown, Alex Alger still has a ton of talent to play with. Some of those guys are Romano, Seningen, Zajic, Hunter, and Jaquay. Alger is a '95 birth year player and is committed to play for Miami University (D1) next season. Seningen was one of the first players that the Tomahawks tendered during the 2014-2015 season. He's a small player standing at only 5'8, but he plays a big game. He spent the last three years playing for the Philadelphia Jr. Flyers. In 106 career games, he scored 102 points. Of all the new players on the Tomahawks roster this season, Seningen comes to town with some of the best scoring stats to date. With that said, this will be his first season at the Tier Two junior hockey level. It'll be interesting to see if he can adjust to this level of play. Some guys can, and others can't. If Seningen can make the jump and make an impact for the Tomahawks it'll be great to see. As I've never seen him play in person before, I can only base my judgement on his past stats, but just looking at those, I'm very impressed and excited to see what he might be able to do in a Tomahawks' sweater this upcoming season. Growing up only about an hour away from Philadelphia and then playing for the Jr. Flyers will probably give him some extra incentive this season to play again Ashton. Ashton, of course, are a new team in the NAHL East Division and play their games in the same arena the Jr. Flyers do. Seningen is a '97 birth year player. Jaquay is one of five players that last season played for the Keystone Ice Miners. He's also joined by new Tomahawks' assistant coach, Nick Shackford, who was an assistant coach with the Ice Miners, and before that the Port Huron Fighting Falcons. Jaquay saw limited action last season due to a season ending injury. He last played back in January. He appeared in 29 games for the Ice Miners scoring 11 points (8 goals, 3 assists) and was a plus 5. Jaquay is a big forward standing at 6'3 202lb. He's one of 13 players on the roster from Pa, calling Lansdale home. He had one goal vs Johnstown last season. He's a '95 birth year player. Tikhomirov is one of four goalies on the current Tomahawks' roster. Andrei is one of two foreign players on the roster. Tikhomirov is from Nizhny Novgorod, Russia. The other foreign player is forward, and newcomer, Marc Zajic, who's from the Czech republic. Tikhomirov stands at 6'2, 200lb. He's a '95 birth year goalie, making his first appearance in North America. Last season he played in the MHL and won the league championship. He appeared in 40 games last season and had a save percentage of .912. To put that into perspective, Bednard last season appeared in 37 games for Johnstown and had a save percentage of .913. Tikhomirov was selected by the Tomahawks in this past off season's NAHL draft. He was picked in the third round. Johnstown has four solid goaltenders on their roster and it'll be interesting to see who they keep. Just judging from years past, they'll probably go with three goalies at least to start the season. Tikhomirov is the only goalie that is a '95 birth year. The others are, Gwillim (97), Burggrabe (97), and DeSimone (96). There are many other players on the roster that I'm looking forward to seeing play but these are my top six. Do you have a player or players you can't wait to see at the War Memorial? Let us know with a comment below, or tell us on our Facebook and Twitter pages. The last time this website had any new content was last November. At that time I announced that I would be stepping away from the usual posts, as I had other writing opportunities that were going to take up a majority of my time. During the months after I stopped reporting all the latest news on the Tomahawks, the team and city has seen itself become the first ever Hockeyville in America. This just adds to the rich hockey history that Johnstown can be proud of. Another season is quickly approaching the Tomahawks, and players looking for be a Hawk for the 2015-2016 season are currently in town participating in the team’s main camp. Out of the 80 players expected to attend the final tryout, a total of around 30 players will be invited to Johnstown’s training camp taking place later next month. This upcoming season looks to be the Tomahawks’ most exciting to date. That’s where I got to thinking about how much I do miss running this blog everyday, but with the work load I still have chasing after my dreams, I can’t update and report every little story coming out of Hawks nation. That doesn’t mean I can’t do something. Something that not only is informative but also entertaining. I’ve decided that I will do my darnedest to make new content for TheTomablog and try and do it on a somewhat consistent basis. What has been taking up all my time? Well, simply put, freelance writing. Writing and actually making money. The prime focus has been on screenwriting. Over the last year, almost a year, I’ve been working on some (for hire) projects. They’ve ranged from short films, to feature length, and even television pilots. One of those pilots lead to an opportunity to write for the series. In it’s first season of ten episodes, I was honored to be able to write eight of the episodes. You might be seeing the show on your television sometime soon, or at least online in the future, but exact details are still being laid out. Writing for film and television not only takes up a ton of time, but it’s also creatively draining. After a long days work of sitting at the computer creating new worlds from my mind, it’s hard to then write even more, even if it’s about the team you love, the Johnstown Tomahawks. TheTomablog’s Twitter and Facebook pages continue to get more and more followers, and I feel that I owe those readers some new content. They’re just like me, die hard hockey fans, looking for all the information on their favorite hockey team that they can get. So, I have to write something, and this is what I’ve come up with. Over the next season I’ll be adding new content to Thetomablog. You’ll be able to find the classics like, the Attendance report, and Alumni Stats (Where are they now), but you’ll also find new articles on the site. For the first two years on this site, I wrote about all the breaking news, even breaking some news before The Tribune, or WJAC-TV got to it. 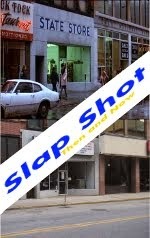 I did player features, game previews, game reviews, the Slap Shot Then and Now post, and many other things. I’m not going to be able to do all of that again. But what I can do is a little mix of it all into something new. When I say something new, what I really mean is, something new that you haven’t seen on the site before. TheTomablog will move away from news reporting and move into Reviews and Columns. What does this mean? Instead of doing game preview, and then at the end of the weekend reviewing everything, I’ll just be doing the reviewing at the end of each week. These reviews will be different, thought, than telling you exactly what went on, play-by-play. Instead, it’ll flow a little more like a film review, telling you what was good about the weekend, what was bad, and my overall rating of the team and it’s performance for the week. If you’re looking for more of straight up recaps, you’ll be able to find those on the team’s official website, or from the local newspaper. I’ll also write columns on various things throughout the season. These will be articles that will be entertaining, informative, and based solely on my opinions. I already have a few ideas for stories. If you don’t agree with what I say, that’s perfectly fine, I’m sure some of the things I’ll write about you won’t agree with. There’s just a few things you need to remember. Though I like to cover the Johnstown Tomahawks, I AM NOT AFFILIATED WITH THE TEAM IN ANY WAY. I have NEVER worked for the team. This is key to remember. I AM ONLY A FAN with a blog. Take that however you’d like, but don’t forget it. If I say something you don’t agree with, or say something you do agree with, it has nothing to do with the way the team official views things. You can start your own blog and write whatever you’d like. It’s pretty simple to do in fact. The hard part is the marketing and getting people to read. I can’t make any promises that I’ll be able to follow up on what I’m promising here. I might get an awesome project to write on, or one of my own, and it could take up all my time. But unlike times before, during this long break, I’m going to give it my best shot. So, when can you start to see new content? Soon. I’m going to revamp the site (maybe even make a new one) and start adding new content. Since the Tomahawks don’t play until September, you won’t see game reviews until then, of course. I might write a little sample of a game review before that, just so you can get a taste of what I’ll be like. Lastly, you can find me away from TheTomablog at a couple different places. I currently am a contributor at www.jeenuh.com where you can find some pretty funny content about anything and everything. The articles do contain strong language and themes. Okay, that’s everything for now. Thanks for reading and I can’t wait for the 2015-2016 Tomahawks’ season to get started.